Protest in SarawakZwei vom Holzeinschlag durch die Firma Interhill betroffene Penan-Dorfgemeinschaften haben eine Straßenblockade errichtet, um den Holzeinschlag in ihrem Wald im mittleren Baramgebiet zu unterbinden. Interhill, mit Sitz in Miri, Sarawak, ist früher schon durch eine zerstörerische und rücksichtslose Holzgewinnung aufgefallen und hat immer wieder Protestaktionen provoziert. Zudem sei, so berichtet der Bruno Manser Fond aus Basel, Interhill der Besitzer des Pullmann 5-star Hotels in Kuching, der Hauptstadt Sarawaks. Das Hotel werde von der französischen Arcor-Gruppe betrieben, der die illegalen und umweltzerstörenden Holzeinschlagseskapaden des Hotelbesitzers Interhill unangenehm, weil ruf- und geschäftsschädigend, sind. The Penan accuse Interhill of particularly aggressive and environmentally destructive logging during the past months. Several attempts by the communities to nego! tiate with Interhill responsibles have failed. Interhill had already been accused of similar conduct in 2009. An independent study commisioned by the French Accor group showed at the time that Interhill had been involved in illegal and unsustainable logging practices. Following pressure from Accor's sustainability department, Interhill promised to better its conduct but has obviously failed to live up to its promises. The Bruno Manser Fund has learned that Interhill called the police and forestry department officials to dissolve the blockade but the Penan are currently upholding their protest. 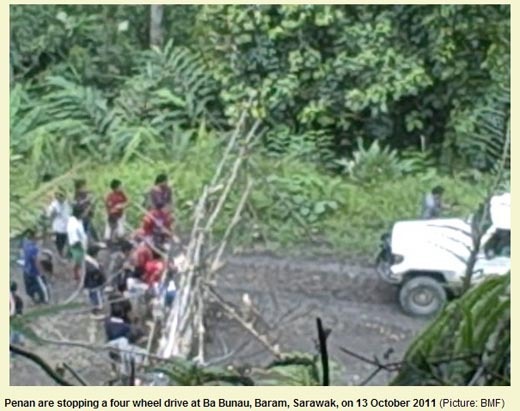 In December 2009, six Penan communities of the Middle Baram region jointly filed court cases to claim land titles over their customary land and asked for the logging licences to be declared null and void. The cases are currently pending at the Miri High Court. The Bruno Manser Fund is calling on the Interhill management to instruct their staff to! immediately stop the destructive logging of the Penan forests and to send a high-ranking delegation to the blockade site to apologize for the company's conduct. Please stop the destruction of the rainforest in Sarawak. Please allow the Penan people to continue to protect their traditional lands. I support the Penan and the Bruno Manser Fund with call for justice and ask immediately to stop the destructive logging of the Penan forests and to send a high-ranking delegation to the blockade site to apologize for the company's conduct. Please respect the Penan as beings demanding for their human rights. They want to live true to their traditions of livingness. And please obey to the fact that the very big percentage of earth´s population wants the last and remaining rainforests not to be destroyed but to be saved! One cannot reach or maintain happiness for oneself while destroying the happiness of others. The way to get awareness. Bitte stoppen sie diesen Wahnsinn und wachen sie endlich auf oder sagt Ihnen die alte und schon sehr oft wiederholte Prophezeiung des kanadischen Indianerstammes der Cree wirklich nichts. \\\" Erst wenn der letzte Baum gerodet, der letzte Fluss vergiftet ist werdet ihr erkennen das man Geld nicht essen kann \\\" ! Soweit solle es anscheinend wirklich kommen oder was seid Ihr für dumme Geschöpfe das ihr nicht erkennt was ihr anrichtet. Traurig nicht nur für alle anderen Lebewesen ob Mensch Tier oder Pflanzen sondern auch für euch den ihr seid unfähig auf euer Innerstes zu hören um zu sehen wie verzweifelt eure Seele über eure Taten ist. Und da kann man wirklich nicht mehr sagen \\\"Vergib ihnen Vater denn sie wissen nicht was sie tun\\\" !!!! Sie wissen was sie tun. Stop the destruction of the rainforest! Respect the Penan People! Können wir nicht endlich einsehen, dass dieser Raubbau aufhören muss, bevor alles zusammenbricht? Was macen wir danach, wenn sämtliche Wälder gerodet, sämtliche Ressourcen ausgebeutet, alles Wasser versiegt ist? Mich würde es überraschen, wenn die Verantwortlichen darauf eine Antwort hätten. Stop now the destruction of the rainforest and respect the Penan people! Accept now, the world and all people need these rainforsts !